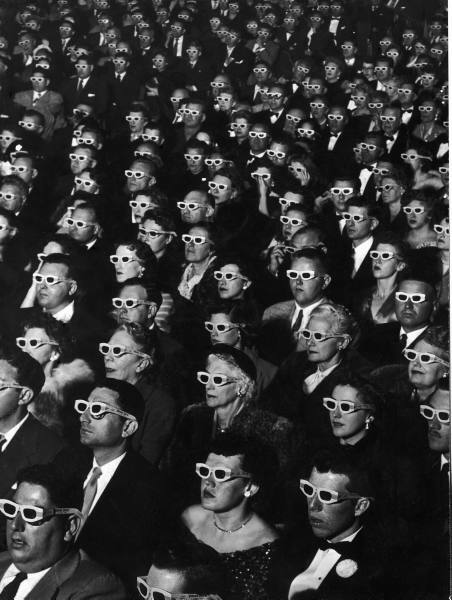 This is one version of the classic Life Magazine photograph of the audience watching the first 3D color motion picture. It’s been a while since people dressed up to go to the movie theater. The date was 1952, and since then this image has become emblematic of all that was odd, dispensable, or dangerous about the 1950s. We see the American middle class lined up in rows, willingly clouding their vision to be transfixed by the mass media on behalf of civic conformity. Serious, silent, formal, and numbingly uniform–what’s not to like? Cool, huh? 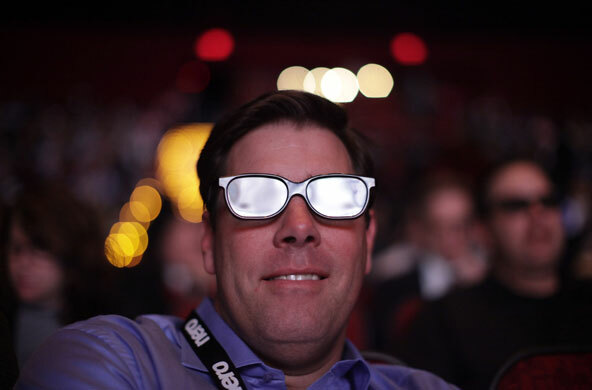 This happy camper is watching a college football game in 3D in Las Vegas. Obviously the glasses have gotten a fashion upgrade. The photo suggests other changes as well. Now we see not the mass audience of 1950s popular culture, but instead a single individual relatively isolated from those in the soft focus background. Now the photographer zeros in on the individual’s experience, and his happiness clearly is his own and not related to those around him. He is illuminated, as if the spectacle is being produced just for him. Or at least for those like him–the niche audience able to afford the trip to Vegas and whatever else went into this show. This inversion from the mass audience to the isolated spectator can be read as a shift from a culture of collective solidarity to one focused on individual autonomy. Conformity is not a problem, and as for the rest, well, let the market take care of that. As with better eyewear and improved projection, this is supposed to be progress: whereas the eyepieces in the first photo are dark, his lenses are shining with enlightenment. And it may be progress. The audience in 1952 was watching “Bwana Devil,” which is all one need say about that. At the same time, one can’t help but think that this is a case of the same thing coming around again. What people need from their media today is not more “life-like” film and video projection but an upgrade in content. And perhaps now more than ever, we don’t need glasses that make it easier to not see those around us. Photographs by J. R. Eyerman/LIFE and Jae C Hong/AP.